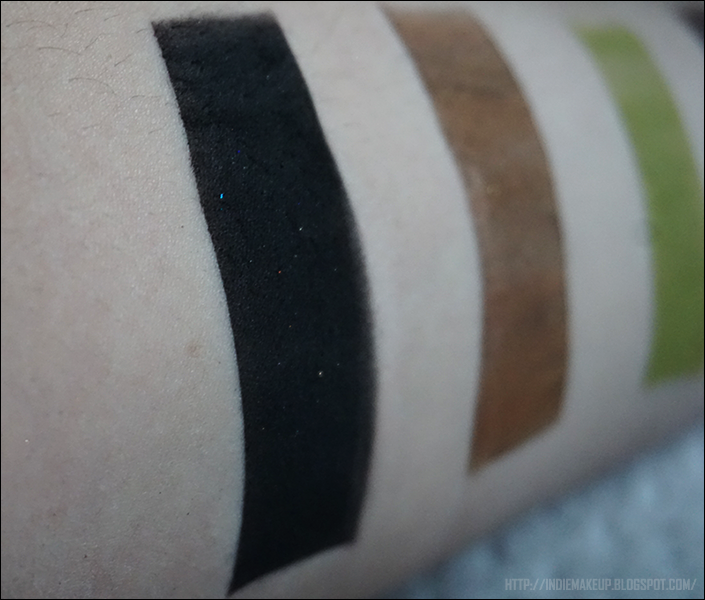 Today I have for you swatches and a review on Ten Three Labs! Ten Three Labs only opened in the Fall and has already created quite a buzz in the indie scene. Ten Three Labs offers eye shadows, lip balms, and perfumes as part of their regular catalog along with limited edition collections and COTM's. 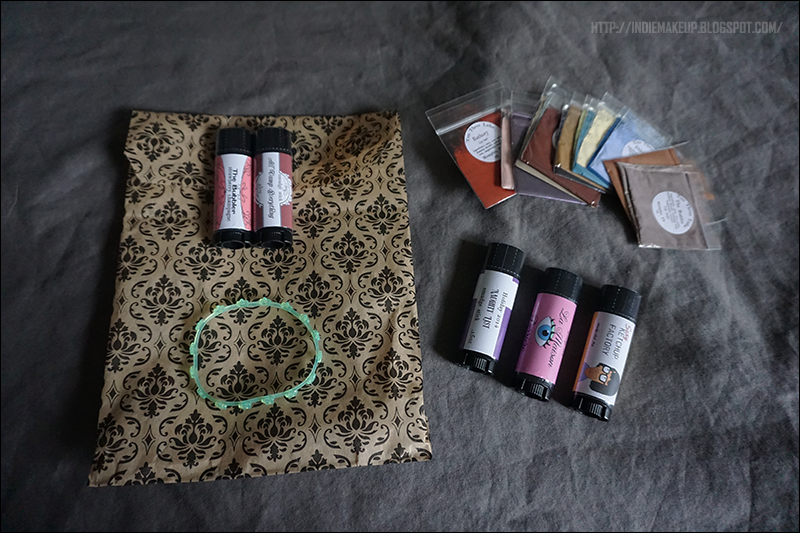 I wanted to try a variety of products so I took advantage of TTL's blogger discount and picked up a few different smudge sticks, the Grand Reopening collection, and a few random shadows. My reaction when I saw that USPS delivered my order a day ahead of schedule. GUYS. I am a huge Bob's Burgers fan! I'm currently binge watching the first two seasons on Netflix. 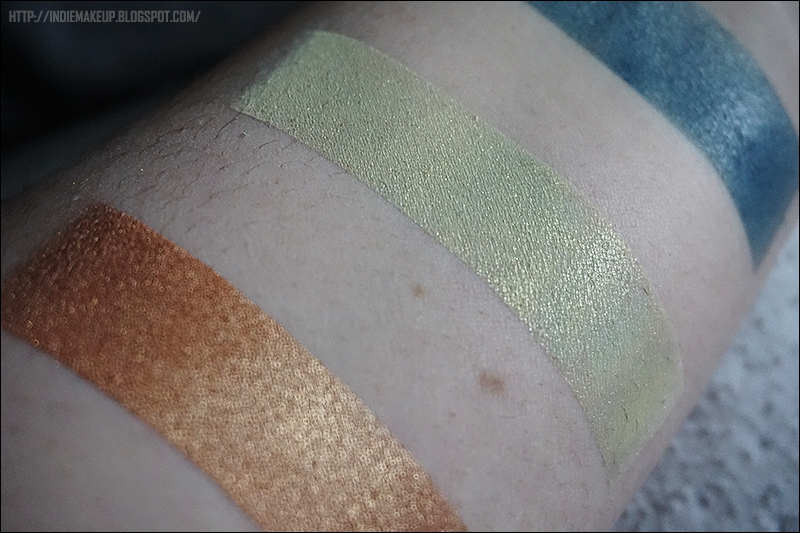 Naturally I felt the overwhelming sensation to immediately swatch when it came in the mail. 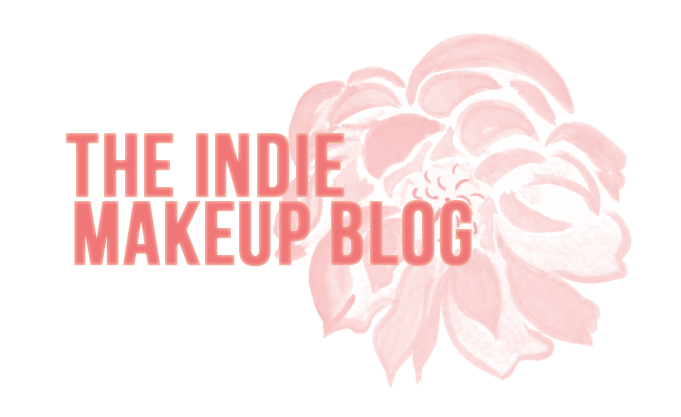 This post will be focusing on the eye shadows. I will most likely do a post on the lip balms later on. The collection is mainly comprised of mattes and demi-mattes with some satin and frost finishes thrown in there. 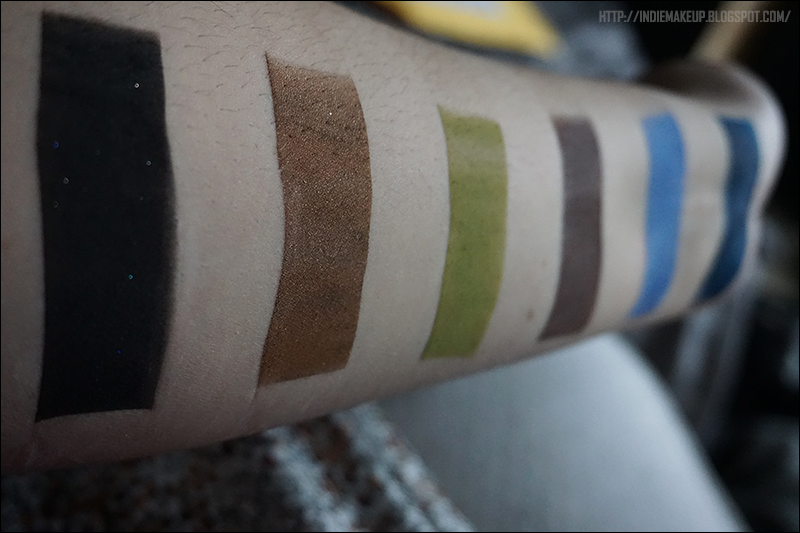 The Mattes applied very smoothly and were nicely pigmented. From left to right: Thank You for Loving Me, Zombie Butts, Bells, Bells, Bells, Hello Blondie, It's your Funeral, Capoeira. Capoeira is a frosty rosy-taupe. 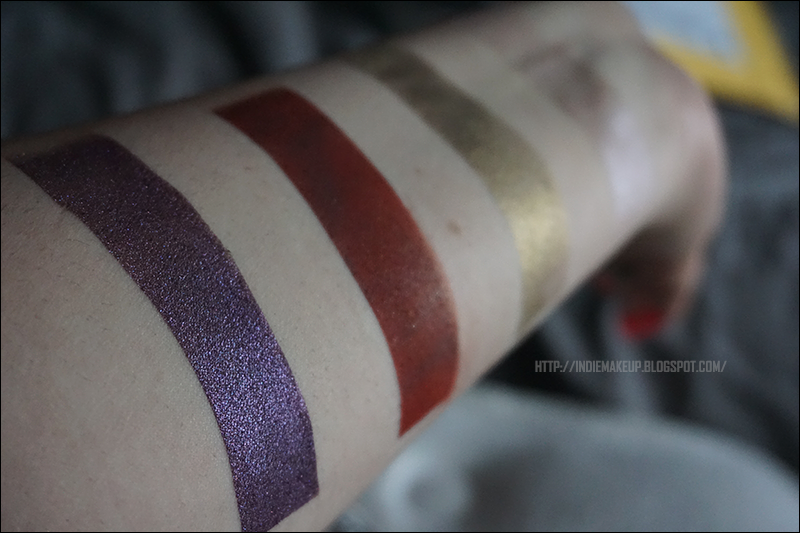 I knew as soon as I saw swatches of it that this was going to be my favorite and I wasn't let down. This shade is absolutely gorgeous. On the lid for a neutral eye or as your inner color highlight, these kinds of shades are always welcome in my collection. No glitter glue on this one or the next because I forgot it! It's Your Funeral is an azure blue with a satin finish. I like that this shade is more of a subdued blue. A lot of people are hesistant to wear blues in fear of looking like Mimi from the Drew Carrey Show but I think this one is more wearable than the typical blue. This would look pretty paired with Siren Song from Siren Song Cosmetics. Hello Blondie is a pale yellow with gold shimmer. In pictures it pulled more green but it is a true light yellow in person. Pretty pastel shade that reminds me of Easter and spring. I don't think I own any other yellows so I'm not quite sure how I'm going to incorporate this shade but I'm happy to own it as it rounds out my collection! Bells Bells Bells Bells is an orange bronze with gold shimmer. 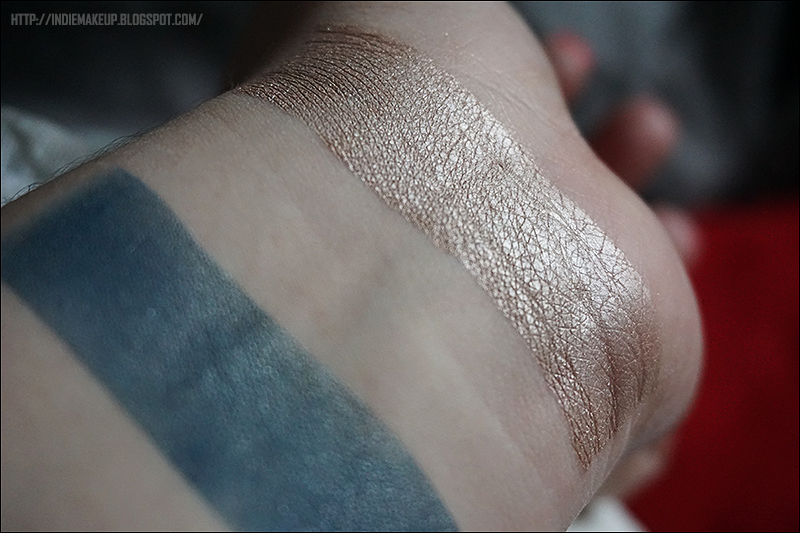 This shade is hella pigmented and super sparkly. 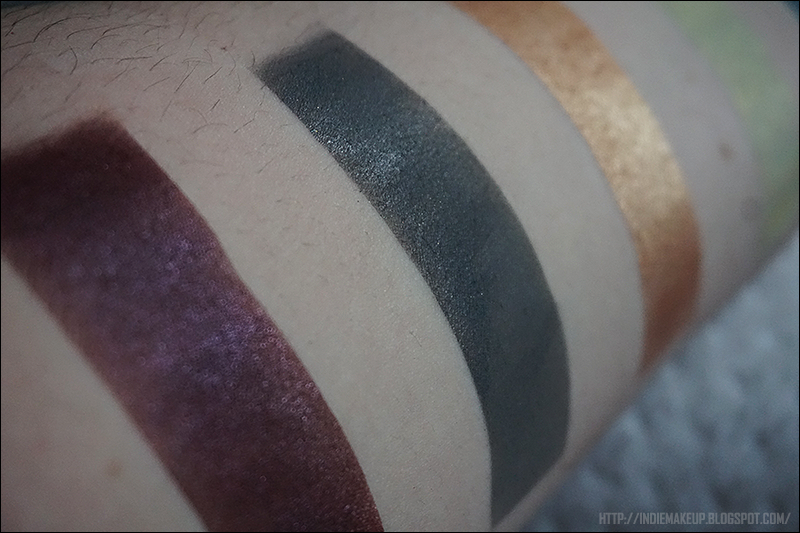 This shadow is perfff to pair with some of the darker browns and reds in this collection and helps round it out. Zombie Butts. The name makes me cackle like a five-year-old on the inside. This shade is a cool demi-matte grey. I noticed that these shades were more matte without GG and the adhesive kind of brought out the subtle shimmer hidden by the base. 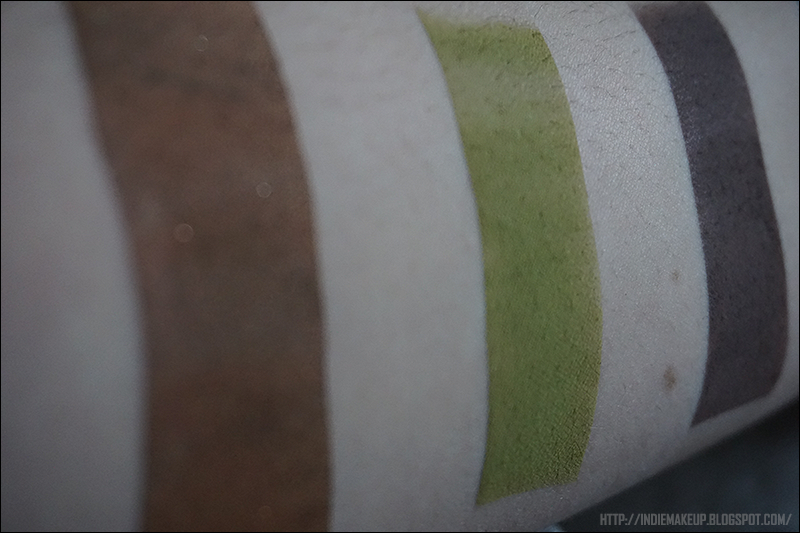 You can kind of see it in this swatch. I think that's pretty cool because and I appreciate the level of dimension you can achieve with these shades. 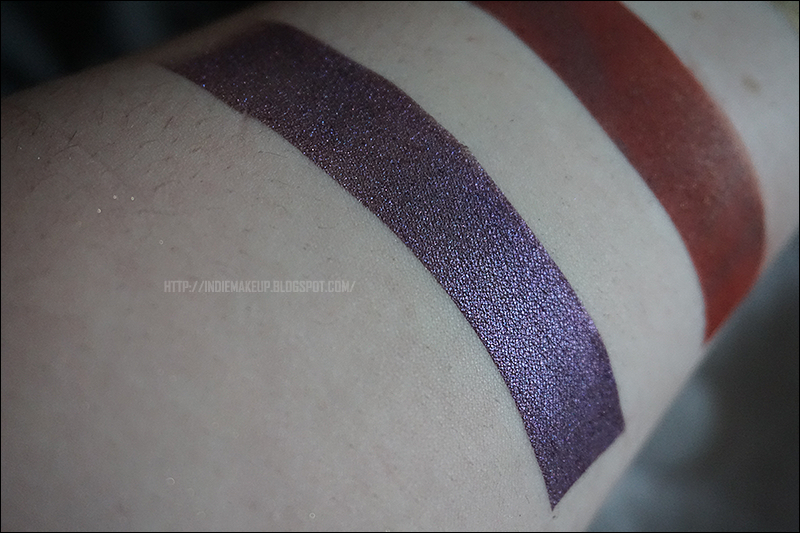 Thank You for Loving Me is a maroon with purple shimmer. Very pretty. Reminds me a bit of Victorian Disco Cosmetics Queen Beryl, which is discontinued. I will have to dig the other one out and do a comparison. 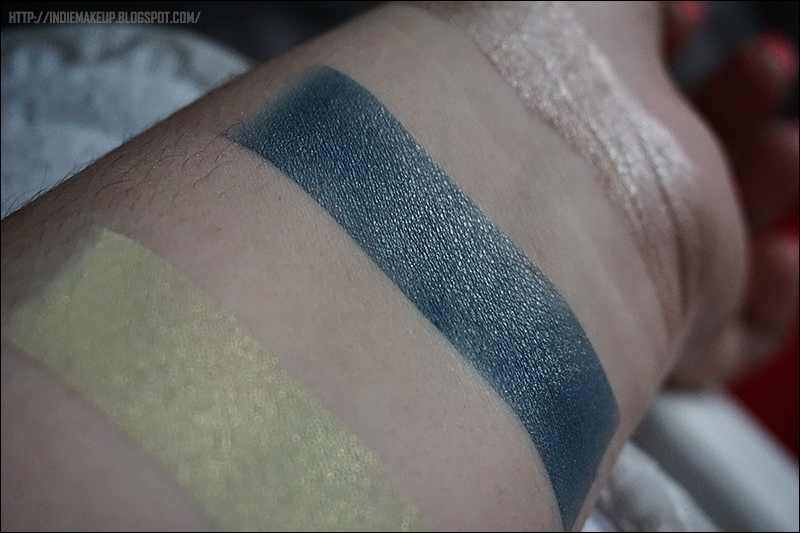 I am really excited to use this color, I think it will be flattering on brown/green eyes. 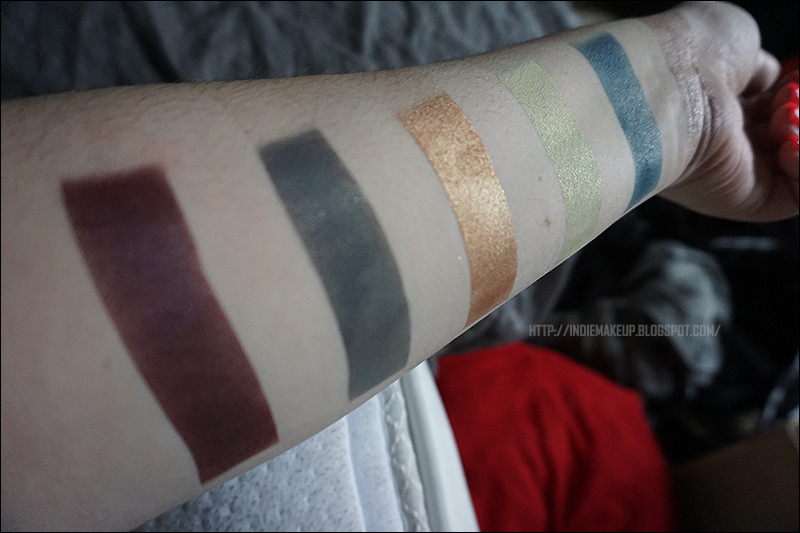 From left to right: Oil Spill, Night Butterfly, Kuchi Kopi, The Buttler, Ehhhaugh, Electric Love. Electric love is a dark teal matte. That fact that its matte makes this shade pretty unique. Applied nice and opaque too. 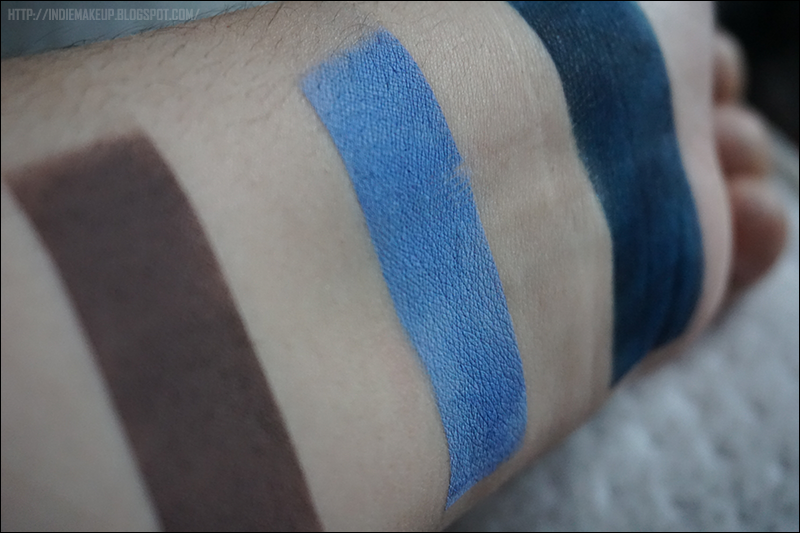 I've been needing a matte blue dark enough to use in the crease, and this fits the bill perfectly. 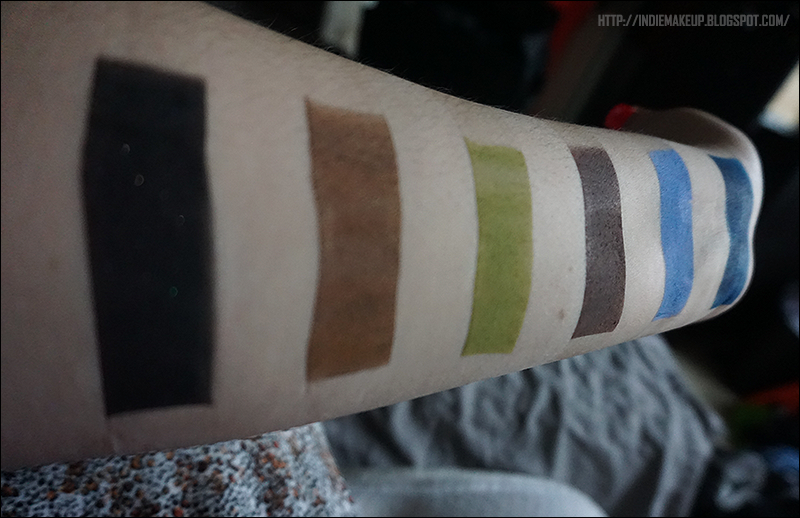 The swatches of these mattes are without GG by the way. Ehhhaugh is a matte cornflower blue. Also a very unique shade, I don't think I have a shade like this in any finish. Possibly inspired by the color of Tina's shirt? The Buttler is a neutral matte brown. 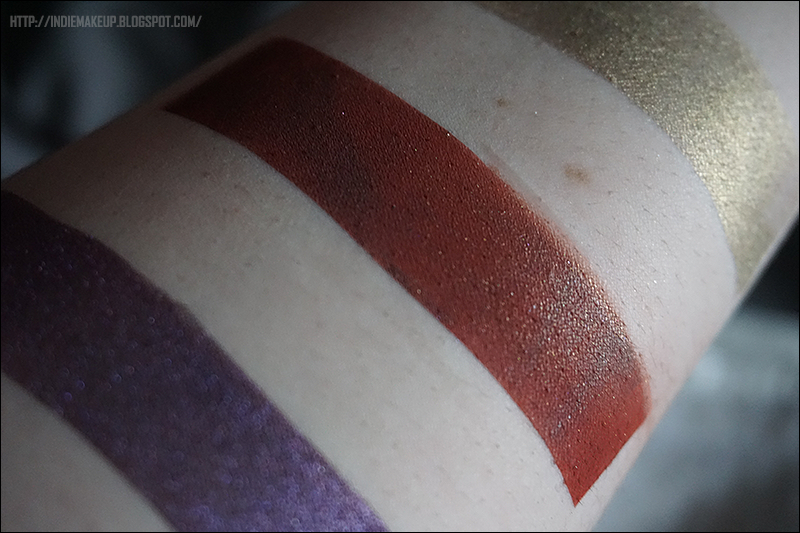 This shade was incredibly smooth and pigmented, one of the best mattes I've come across in the indie world. Night Butterfly is a russet brown with a satin finish. Would be a nice addition for neutral lovers. Oil Spill is a matte black with scattered rainbow sparkles. 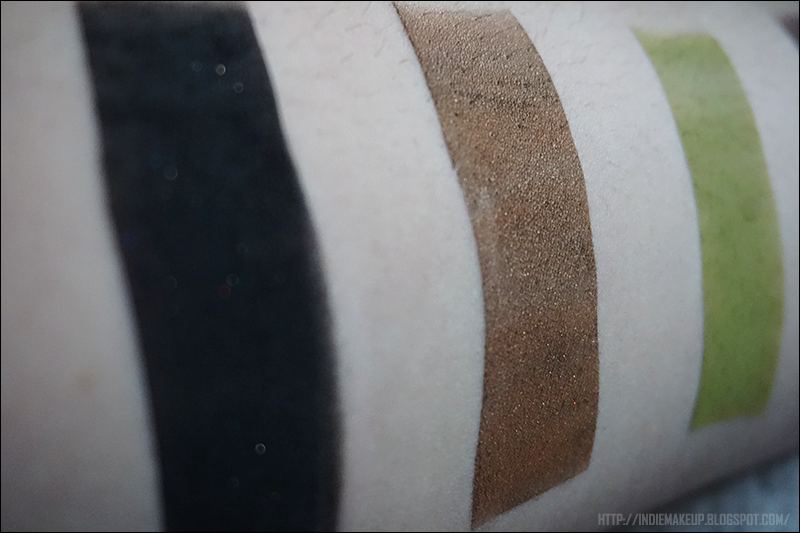 The black base had excellent pigmentation. Usually this kind of shade is loaded with sparkles as opposed to random scatterings. I imagine the sparkle would barely be visible blended out on the eye. And that wraps up the Grand Reopening collection! Onto the famous ladies of history collection. 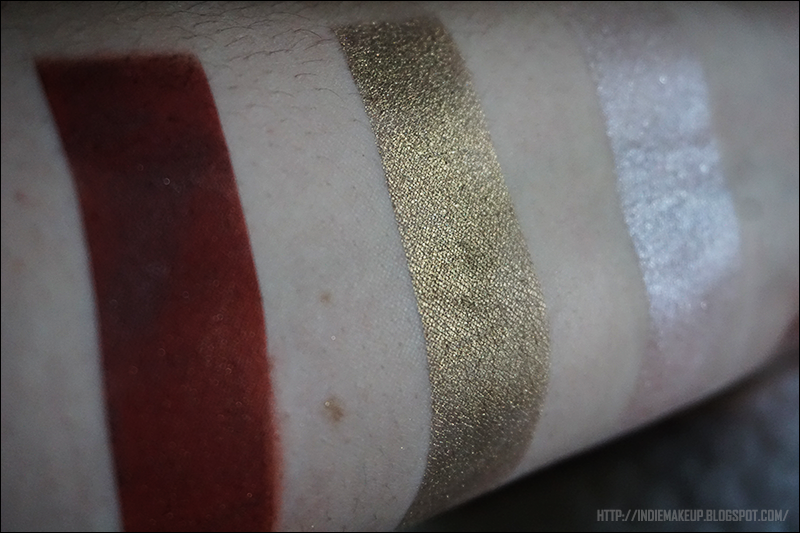 From left to right: Hiawatha, The Bathory (free sample), Hatshepsut, Antionette. Antionette is a light sparkly pink. It's a pretty girly shade. When I do actually wear pinks, I tend to go for shades like these. 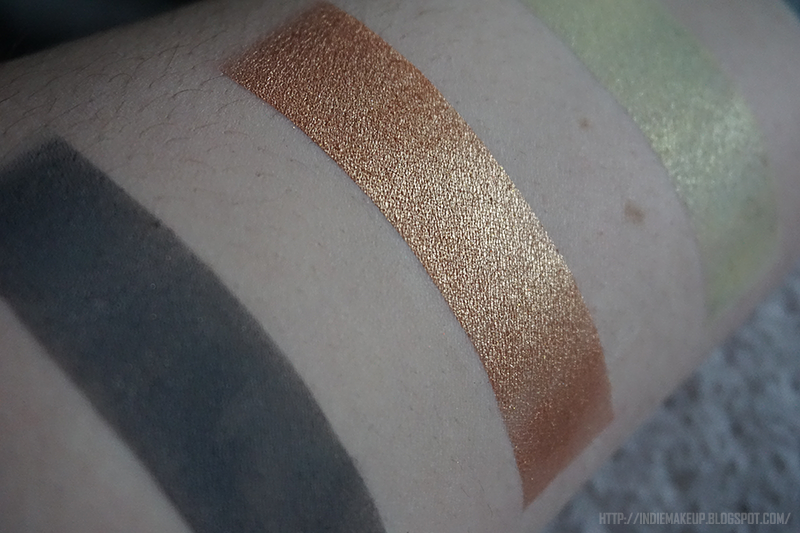 Hatshepsut is a shimmery antiqued gold. I prefer my golds on the cool side, like this. When I look at this shadow, I think of ancient Egypt so naturally the name is very fitting. The Bathory is a very warm red with a satin finish. Gorgeous gorgeous gorgeous. I'm so glad Cara included this one for me. I have a hard time pulling off such strong warm shades but dammit I'm going to wear it anyway! Hiawatha is a dark shimmery purple. Purples are my ultimate weakness and of course I absolutely love this one. Might be my favorite of the entire haul! 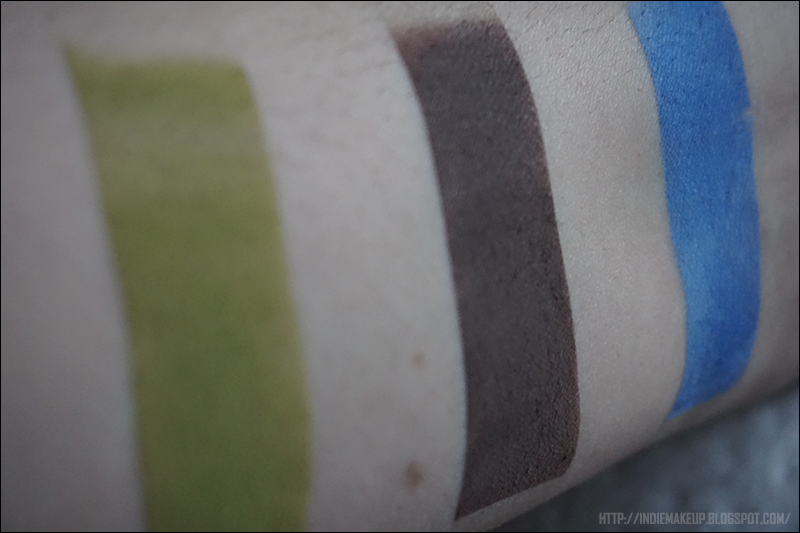 Final Thoughts: The quality of the eyeshadows is excellent. 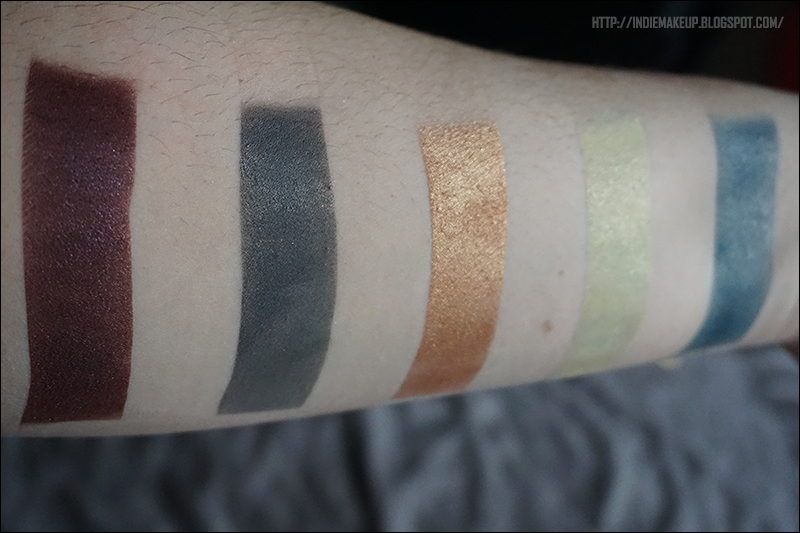 The Grand Reopening collection contained a lot of unique matte shades which can still be a bit hard to find in the indie makeup world. Furthermore, they applied very smoothly. 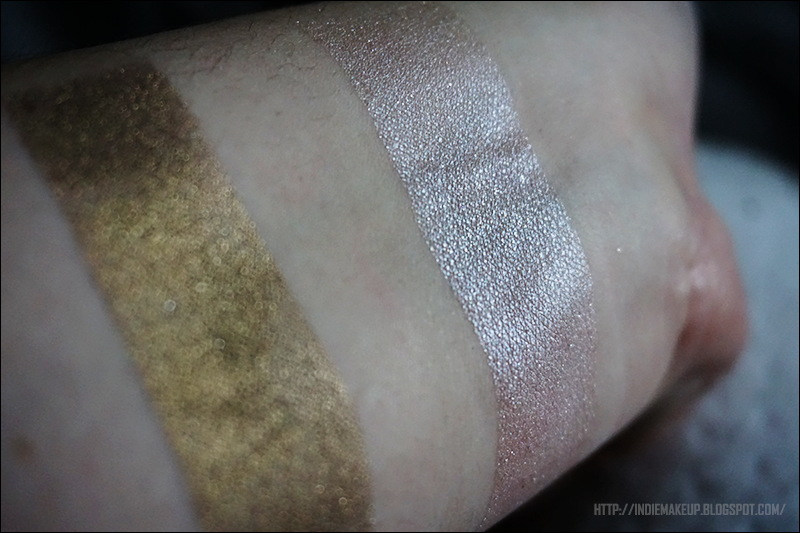 The shimmery shades were also very nice. 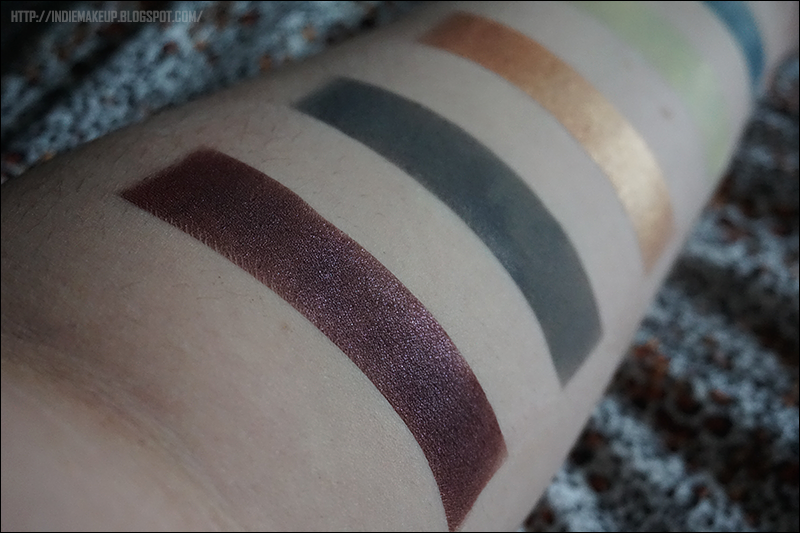 I love each and every shade I got from the Powerful women of History collection and will definitely be picking up some more from that collection later on. Overall, I am very pleased with my order and would recommend the shop!